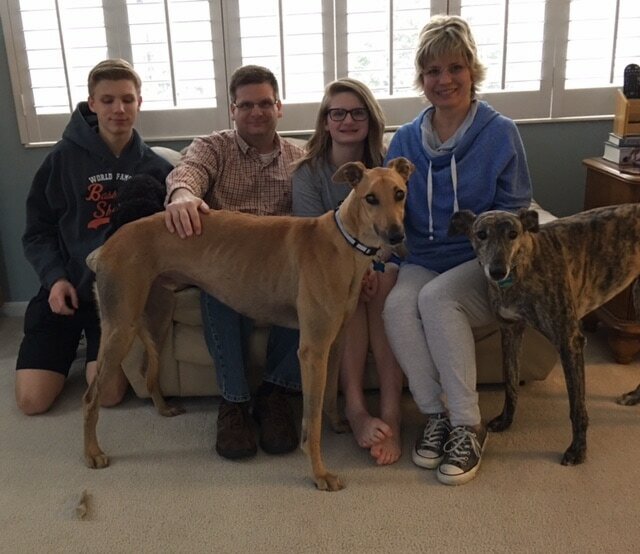 SH Hello Goodbye was fostered by this family, he was their first foster dog. Well they couldn't let this sweet boy leave so he is now home in Liberty Twp. with Devin, Mike, Daryn and Shannon. Layla is their brindle greyhound and Henry who is a black miniature poodle is in Devin's lap, can't be seen. Shannon fell in love immediately with this quiet boy, then the entire family decided he was already HOME!